We want to plant twice as much garlic this year as last year (more on that later), so I started eying the sweet potato beds this week, wondering if they could be dug. 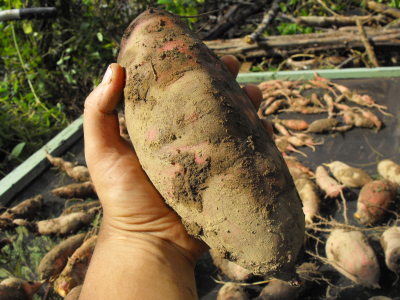 A search of the internet admonishes you to harvest your sweet potatoes before the frost to avoid damage to the tubers. But how long before? One easy way to know when to harvest crops is to look at the variety's days to maturity. Beauregard sweet potatoes (our variety) require only 90 days. Since we put out our slips between May 12 and July 1, they should be ready to harvest between August 12 and September 1. Looks like we can take a look! 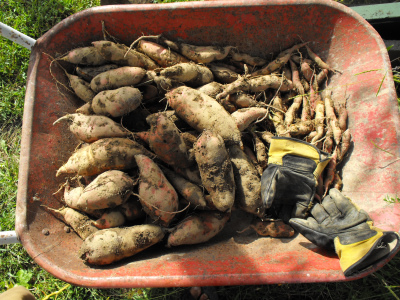 I dug up a few test plants and discovered a good selection of large, medium, and small tubers. Presumably, some of those useless tiny tubers would turn into useful medium tubers if we let them wait another week or two. But I decided to harvest anyway. After all, harvesting at this time last year let us cure our sweet potatoes completely before the frost and we're still eating those tubers. I dug up a quarter of our sweet potatoes on Wednesday and was very impressed by the showing. Last year, the deer ate our sweet potato plants mercilessly, which led to small tubers that were few and far between. Looks like Mark's deer deterrent is doing its job! Those small sweet potatoes are not useless, we wash them toss them in olive oil and roast at 350 until fork tender and eat them like oven fries. Didn't eat them all at dinner , they are wonderful snakes cold. Great sweet potato harvest-I hope mine looks just like yours. About those skinny roots... Last year I has an awful harvest where the majority were scrawny. Since they were all I had, I couldn't bear to trash them. The plan was to look up a recipe for them but never got around to it.... ....until this past spring where I noticed that many of them had sprouted. SO-in April '13 I planted them. Just as a test, to see what would happen. Last week I pulled two of them up. They are now 'normal' sized sweets. They both look weird b/c they had lots of runners growing out of them (I left the runners to keep growing in the dirt). So-these 2 sweets are in the cupboard doing their two week cure and I can't wait to see how they turned out. Maybe they're all woody inside and maybe not! Will find out soon. You ever hear of anyone ever doing this w/ the roots? Ever tried it yourself? P.S. Good luck w/ your homestead/blog! Looking good to me.